This relatively new variety of Euonymus hamiltonianus has one of the very best displays of the colourful fruit clusters that make Spindle trees so popular. Euonymus hamiltonianus 'Miss Pinkie' is a compact shrub with large green leaves in spring and summer, turning yellow in autumn. The autumn leaves contrast wonderfully with the heavy clusters of pink fruits which encase vibrant red-orange seeds from August to November. 'Miss Pinkie' will create bright splashes of colour at a time when many other shrubs in the garden are fading away for winter. With a final height and spread of 1.5 x 1.5 metres, Euonymus 'Miss Pinkie' is suited to small gardens and will grow best in a well drained yet moist soil in a sunny or partially shaded position. Commonly know as Hamilton's Spindle tree Miss Pinkie, it is named after Francis Buchanan-Hamilton (1762-1829) a Scottish physician who, whilst living in India, contributed significantly to the field of botany. Our pot grown Euonymus 'Miss Pinkie' can be planted at any time of the year. Choose a moist well-drained site in full sun or partial shade, then remove all weeds and grass within a metre of your desired planting hole. Dig a square hole as deep as your root mass and approximately 2x as wide. To help Spindle Trees establish more effectively, we advise sprinkling root grow in the hole, especially if you have poor soil. If you’re planting in spring, summer or dry weather, water well and regularly for the first few months. Make sure to keep an eye on your young plant and increase watering if there are extended periods of hot or dry weather. If you’re planting in autumn, you may only need to water your tree a little. Once planted, it is important to keep the area free of competing weeds and grass for the first couple of growing seasons. 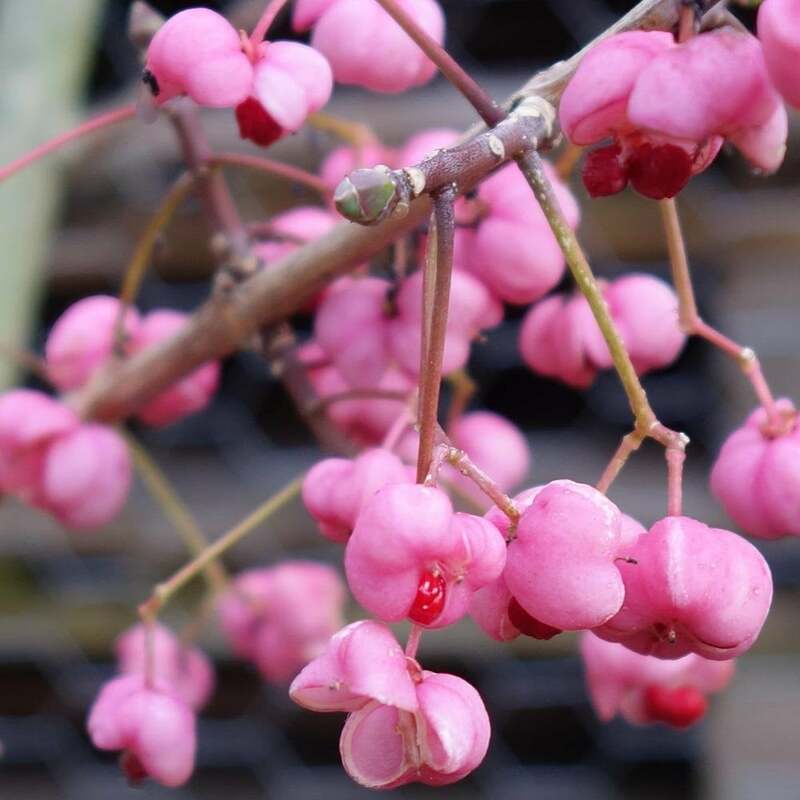 Spindle trees do not require regular pruning. If you wish to tidy up your Euonymus Miss Pinkie tree, do this during the dormant season. Focus on removing any damaged, diseased or overcrowded branches. If you require a clear trunk, remove any side shoots to help raise the crown.